Mille Lacs is recognized as The Best Bass Lake in the United States for smallmouth bass by Bassmaster magazine. Need we say more? Yes, we can! We’re also home of the 2016 and 2017 Toyota Bassmaster Angler of the Year Tournaments. The Super Bowl of Fishing. Right here on Mille Lacs. The Best Bass Lake honor recognizes the best bass-rich waters from among all 50 states. Read more about Bassmaster’s best bass lakes. Or better yet, plan your next fishing getaway on one of the best bass fisheries in the nation. Resorts, hotels or campgrounds? 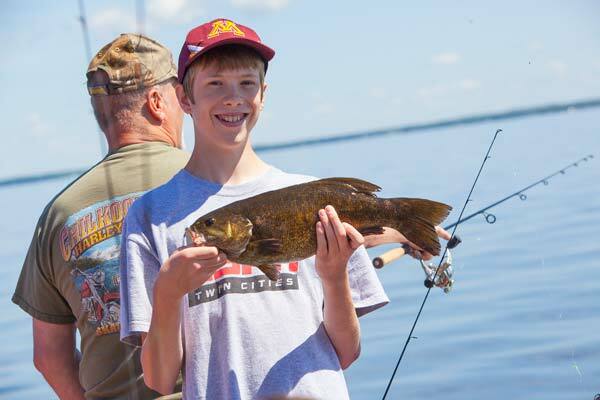 On Lake Mille Lacs, we have it all. Choose your lodging preference, amenities and location and #DoTheLake in a style that suits you! Before heading out on the lake, be sure to check out our collaboration of fishing reports from the area’s resorts and expert fishing guides. Up your chances of catching a lunker smallie on Lake Mille Lacs by having a fishing guide show you the ropes. No one knows Mille Lacs better. Fish on!